MARCH 2008 -- Congratulations to the Junior award winners at the 2007 National Grange Session held in Reno, Nevada. The award winners were all members of Ekonk Community Junior Grange #101. In Creative Writing - 7 - 8 year olds - First Place - Clifford Gervais, 9 - 11 year olds - Honorable Mention - Jacob Gervais. In Creative Art - 7 - 8 year olds - First Place - Clifford Gervais, Honorable Mention - Trevor Gervais, 12 - 14 year olds - Brandi Hawkins. CONGRATULATIONS TO ALL OF YOU! There has been a change as to who may enter the Junior contests on the State level. 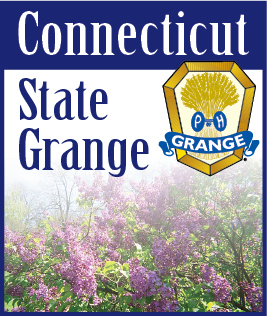 The Connecticut State Junior contests will be open to non-Junior grange members. The CWA Junior contest will still be open to only children and grandchildren of Grange members for this year. The National Grange contests will still only be open to Junior Grange members. Thank you for the cards and calls I received while I was laid up. The doctor said that I can get out a little more, but to take it easy. Thanks again.